Today's spa experience is about as far removed from the social, practical baths of Roman times as possible. Today it wouldn't be unusual to find spa enthusiasts immersing themselves in therapeutic wine, rather than drinking to each others' health! There's no doubt that the Romans would be confused if they walked into a modern day spa. Today's spa experience is about as far removed from the social, practical baths of Roman times as possible. Today it wouldn't be unusual to find spa enthusiasts immersing themselves in therapeutic wine, rather than drinking to each others' health! Here are six spas where the setting or the treatment will be a surprising and unforgettable experience. Why not combine two luxurious passions - wine and spa? 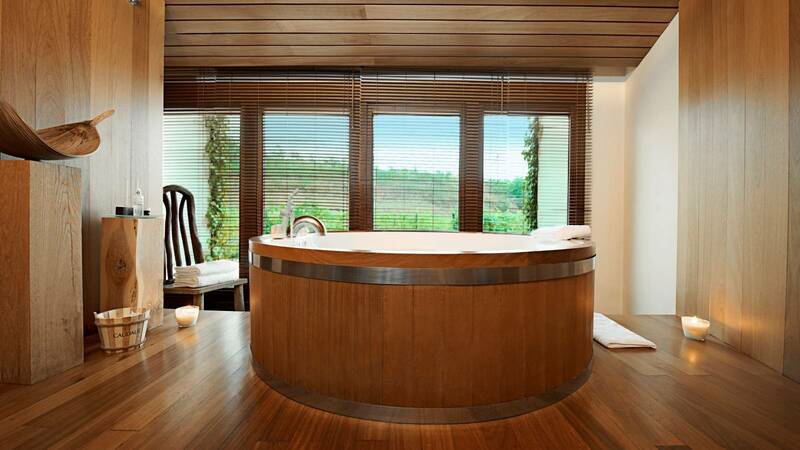 Bio-science meets grapeseed polyphenols to result in marvellous wine-inspired spa treatments at the Vinotherapie Spa Caudalie Marques de Riscal, located in northern Spain's Rioja Alavesa wine region. Soak in an oversized wine barrell while looking out to the inviting vineyards next to the spa: after all, vinotherapy isn's the only special thing about this space - it is also a design tiumph of architecture and design. Renowned Canadian architects Frank Gehry and Yvew Collet teamed up to create an incredible facility. Perhaps the most noticeable feature is a truly stunning ruffled roofline, made of 30,000 square feet of titanium, but the interior is incredible too. Here, the colours reflect the distinct gold, pink and silver hues of the Rioja's oldest wines. Luxury and spa never tasted or smelled so good. Cheers! If you've been to Japan, you'll know that some beverages, like tea and sake, have a special cultural significance. Teh Hakone Kowakien Yunessun Spa in Hakone, Japan, takes it to the next level. There is a traditional spa section for those looking for a typical experience, but if you're looking for something different. go to the non-traditional side of the spa. Here, you can immerse your body in a therapeutic bath filled with wine, tea or even sake - several times a day the 2.6 metre red wine bottle pours crimson-coloured (real!) red wine into one of the hot springs. Prefer a tea? A giant tea pot fills the bath with therapeutic green tea. Far from the norm,, this spa is fun, and kitschy at times, but also very relaxing. The facility is large and has plenty for everyone, including families. You may need to bring your own slice of lemon and sugar though!